WooDone in Varna, a small village close to Bressanone, is one of the companies that represents this new idea of mountain, where the past is combined with modernity. WooDone produces fashion glasses and accessories, all rigorously made of wood, with the possibility of coatings in other, always natural, materials, such as roses, violets, slate or Swarovski crystals. The company began in 2009, when Thomas Oberegger and Klaus Tavella, two young entrepreneurs from the Alto Adige region of Italy, decided to try producing something original for the eyewear market. 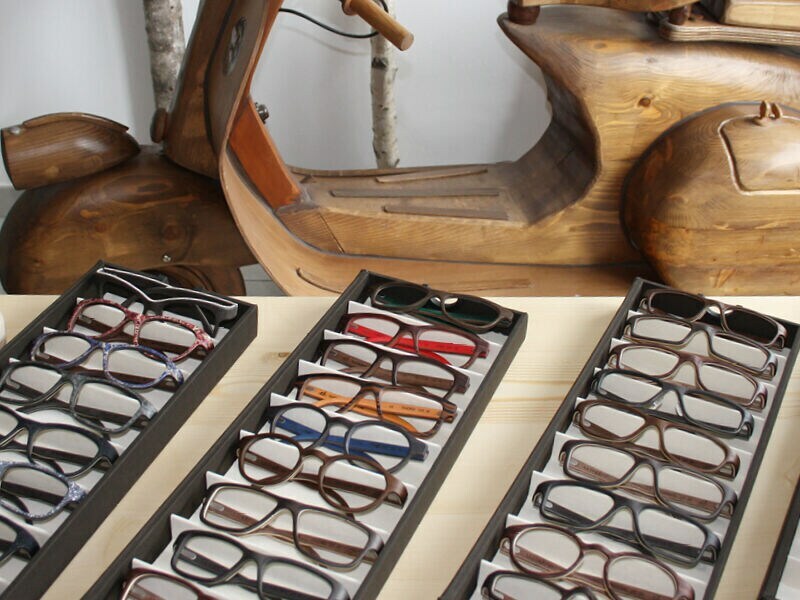 The initial idea was focused on producing glasses with wood by hand, inspired by the beauty of the Dolomites. For a few years there were various prototypes and tests, until they produced their first product in 2011: a set of frames produced with a single piece of wood. The die was cast: the company was setup and all the technological issues tied to the industrial production of an outwardly simple object, but complex to make, were explored. In 2012 the model was perfected and they started making inroads in the eyewear market and in 2016 they inaugurated the new 1200 square metre production site in Varna. The company currently has 28 employees with the nearby offices and showroom housed in an independent building, which is an harmonious blend of modernity and tradition. Currently WooDone glasses can be found in over 3.500 shops of almost forty different countries and sales have passed 80,000 units. In the most important shows of the sector this “made in South Tyrol” product is enjoying growing success and attention. The finished product is an exclusive pair of glasses of great value: in 2016 the German Olympic committee gave the medal winning athletes at the Rio Games, a pair of WooDone glasses, with the wood, which can be coloured, in the colours of the German flag. Behind this idea there is a highly technological production structure, supported by a meticulous work carried out by hand, for parts that cannot be made by machines. The collaboration with the SCM Group was fundamental in this success. Stefano Sorarui, whose surname reveals his Ladin roots, and Marus Gallmetzer, are in charge of the technical aspect of the work. They are both enthusiasts of technology applied to wood working and capable of inventing small and highly ingenious tools, to help the production. They are our hosts for the visit in the luminous and spotless production plant, typically found in a “happy factory”. The first stage of the production is the veneering which gives the glasses shape. Sheets of wood and other materials are selected, cut and joined. The structure of each pair of glasses is formed with at least eight layers that are glued, one by one, with natural products and then, with a press, curved and prepared in the shapes required for the machining. The profiles have three measurements and every type of combination of wood and other materials, which are then transferred to the work centres, which are the soul of the production. Here there is a five axes SCM Accord 40 FXM, where the previously prepared shape is routed and drilled to give the glasses their final shape. The Accord is also used to remove the chamfer on the entire glasses, uniformly, thanks to two floating aggregates, that reduce the manual work downstream of the work centre. The large work table is fully used to create other models of glasses, products without the preformed shape or other WooDone products. Due to the specific use of the Accord work centre, the Maestro software has been fundamental. Stefano has adapted it very simply to the production requirements. Next to the Accord we find a Pratix S12 work centre with three axes that is used to produce the nosepieces and other small parts of the frames, or to produce other WooDone objects that are being developed alongside the glasses. In this sector the only limit is the designer’s imagination. For example they produce an ingenious Speck hand slicer or a heart shaped jewel box made with fragranced stone pine, and also wallets, bow ties, mobile phone cases, credit card holders, cigarette cases, lighter cases, USB flash sticks and so on. Once the machining operations on the work centres has been completed the hinges and nosepieces are glued by hand. The final stage of the production includes the laser marking of the glasses or objects. The finished pieces are then painted with natural products and subject to a strict quality control. The flat surfaces of the other WooDone objects are sanded with a SCM Sandya 600 that, thanks to its technological solutions, allows for many different uses in order to obtain exceptional finishes on each product. The relationship between WooDone and SCM is extremely solid and has been fundamental in the development of the company. 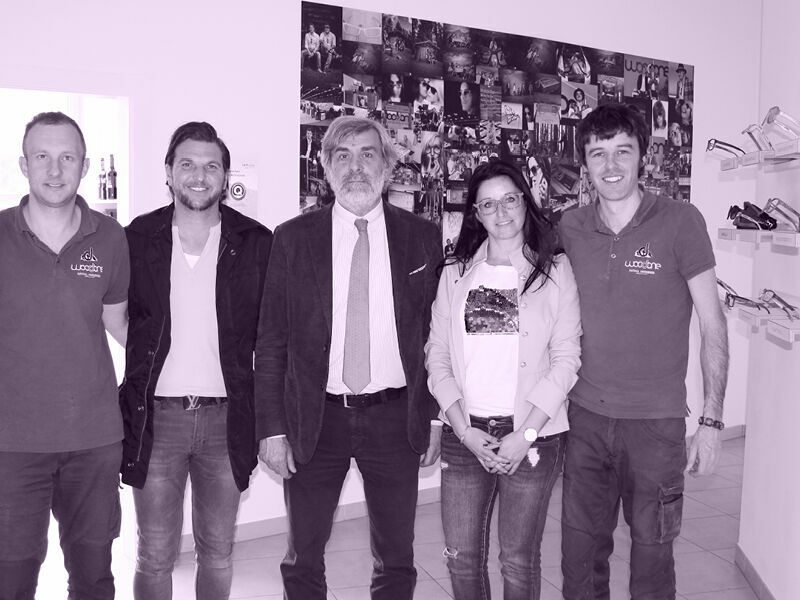 The Technical Manager Stefano Sorarui, had already successfully used SCM products in the past and when he began working with WooDone he didn’t have any doubts. The support when purchasing the machines (in 2016 the company chose the new work centres and the sander) was essential, as well as the after sales service. SCM provided a work centre in order to start producing in-house, what was previously given to a subcontractor, whilst the company was waiting for the delivery of the Accord 40. In just a few days the Accord was fully operational thanks to the support of the SCM technicians. 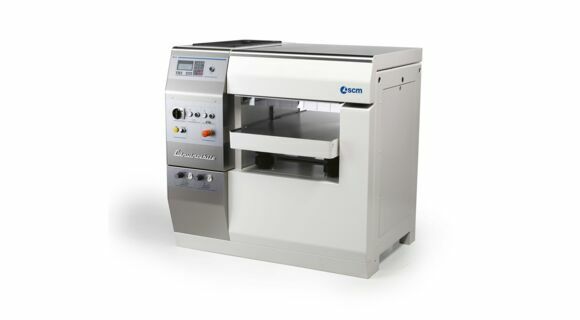 WooDone also counts on a surface planer, a thicknesser, a squaring saw: all from SCM’s L’invincibile range. WooDone’s technical department has clear ideas on the use of SCM technology. It is deemed fundamental to improve quality and increase and speed up the production, decreasing the manual work, which remains important for other phases, such as the selection of the materials, the joining of the wood, the curving of the shape of the glasses, the application of hinges and nosepieces and the final precision finishing. The company is extremely ecologically aware. Waste of wood used for the veneering is reduced to a minimum and the production reject is burnt to heat the building. 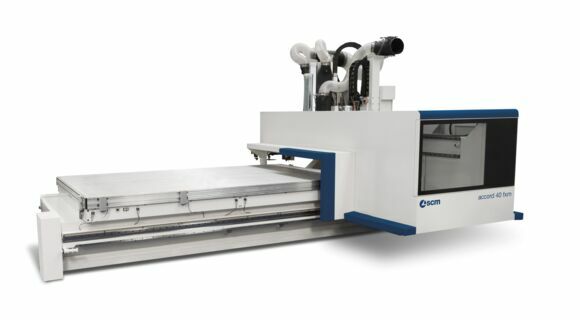 As far as the machines are concerned, great attention is given to reducing energy consumption; the oldest tool in the company dates from 2010.